Meritropolis is the last known refuge for the human race. After "The Event" wiped out civilization as we know it, a system was implemented to ensure the smooth running of Metropolis and it's finite resources. Every citizen is assigned a number ranking based on a variety of criteria including beauty, intelligence, physical prowess, and athleticism. Those with high scores live a more comfortable life. They live in better housing and enjoy better foods while those with lower scores live on the fringe, barely surviving. If your score drops too low, you are exiled from Meritropolis, banished outside of the walls, left to the mercy of the wild and all the savage hybrid beasts which inhabit the land. Charley is lucky, with the second highest score in Meritropolis he is destined to have a comfortable life, but a lifelong, deep seeded hate for the System boils over and is unleashed when he witnesses a small child be sentenced to banishment. His act of defiance sets off a chain reaction that could mean the destruction of Meritropolis and the eye opening knowledge of life beyond the walls. Overall this was a pretty solid read. Fans of The Hunger Games and Divergent will enjoy this book which echos some of those same undertones and themes of powerful elite, corruption, and the rebellion of the people against oppression. The main character, Charley, faces much inner turmoil as he grasps with the morality of his difficult choices. Killing to save innocents, the value of life even if it doesn't have anything to offer you, speaking up in times of moral crisis; these are all themes and ideas that can be applicable across any generation or time period giving the reader pause to consider the implications and consequences. The dystopian world that Ohman creates is unique. The hybrid creatures prowling outside of the wall were quiet imaginative and honestly some of my favorite scenes from the book. As part of a trilogy, this first book really only scratches the surface of understanding this complex world, and my hope is that book two and three delve more into the world outside of Meritropolis as well as more detail about this "Event" which lead to the destruction of the free world. The characters are strong and well written, I am eager to see where Charley goes from here and to learn more about this world that Ohman has so artfully imagined. You can check out Joel Ohmans website here to find out more about Metropolis! 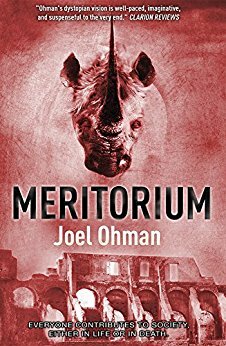 Come back next week to read my review of the second book in the series, Meritorium.